In the wake of reports that Toronto's mayor has been distracted at the wheel, only one question remains: why won't Rob Ford use a driver? One look at his signature provides the only answer that hasn't been put forward, an answer provided not by his aides who are rebuffed when they offer to take the wheel, and not by puzzled journalists who conjecture about the issue. 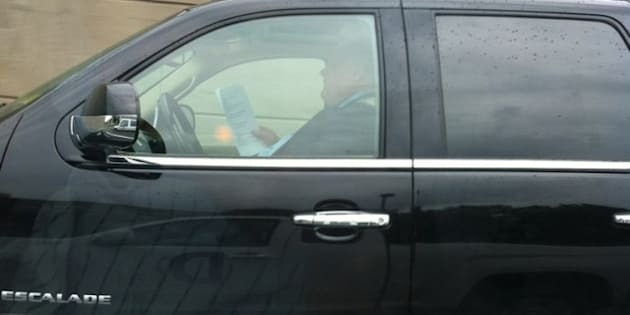 In the wake of reports that Toronto's mayor has been distracted at the wheel, only one question remains: why won't Rob Ford use a driver? One look at his signature provides the only answer that hasn't been put forward, an answer not but forth by his aides who are rebuffed when they offer to take the wheel, and not by puzzled journalists who conjecture about the issue. Ford's signature is unique because, well, it doesn't actually pen his name. So driven is he by the urge to move, to race to the completion of the task, that he lets many details fall by the wayside, such as the need to legibly shape letters so people can read his name. In his signature, the most fully articulated letter is the last, a "D" emphasized by its prominent uppercase. Graphologists conjecture that the person who creates elaborate capitals at the beginning of words is the person who cares about first impressions. The first letter introduces the word and to embellish it means that this writer puts extra importance on the first moment of contact. As they say, "you never get a second chance to make a good first impression." This is the writer who plays to the camera or otherwise selects the right power suit, adorns with cologne and overall manages how he or she appears to others. Notice the elaborate first letter in the signature of Mel Lastman, a former Toronto Mayor known for his dramatic flair. When, in contrast, the writer articulates and emphasizes the last letter, in this case, the last letter of his name, the graphologist asserts a writer who emphasizes closure and getting things done. When completion is the all-important goal, progress can be ramrodded forward with a little less attention to details. Through his dynamic, action-oriented signature, Ford reveals himself to be a personality-style termed in business circles as "the Driver". Merrill and Reid, in their book, Personality Styles and Effective Performance, describe that type as matter-of-fact and to-the-point, decisive and independent, also impatient. Of relevance here, though, is the idea that the strong-willed "Driver" likes, first and foremost, to drive. The story on Ford's peculiar driving habits ran with the headline, "What Keeps Ford behind the Wheel?". May I suggest an answer? Ford's hands-on style has him happier behind the wheel then beside it. Yet, Alexandre Dumas, in The Count of Monte Christo, pointed out a fundamental truth that I will paraphrase here: any virtue in excess becomes a crime. Let's hope that Ford reclaims the mantle of leadership and responsibility and becomes a role model, teaching us all how to properly drive projects forward. He is in a unique position to demonstrate a lesson that relates to every citizen: the line between virtue and vice is a fine one and crucial choices will determine on which side one falls.